Morocco (Carolina Varga Dinicu) is considered the leading performer and authority in her field in the U.S., Canada and abroad, evidenced by frequent invitations to teach master seminars and perform in Germany, Sweden, Norway, Austria, Switzerland, Finland, Holland, Luxembourg, Australia, Israel, Malaysia, Brazil, the UK, Slovenia, the Czech Republic, Panama, Italy, Greece, Morocco, Turkey, China and Egypt. She is a member of the Congress on Research in Dance (C.O.R.D. ), the Society of Dance History Scholars (S.D.H.S. 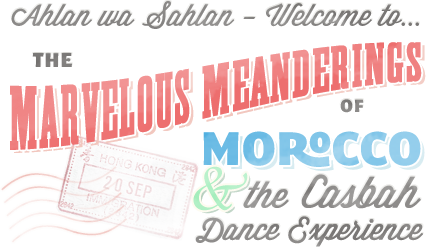 ), the International Coucil on Dance – UNESCO (C.I.D.) and the International Council on Health, Physical Education Sport & Dance – UNESCO (ICHPER-SD). Morocco was awarded two grants by the State Council on the Arts for her choreography in 1972 and 1981 – first in her field to be so honored and the only two-time recipient – 3 NYC Department of Cultural Affairs Community Service Grants, 3 Summer Program Grants, a Materials for the Arts Grant and an Arts Exposure Grant. One of the first inducted into the AAMED Mideastern Dance Hall of Fame as “World Class” for “International proliferation of her art, her myriad of talent and for her untiring pioneering in this, her chosen field of ethnic dance”, she was named 1997 Instructor of the Year by IAMED, was voted Best Dancer & Best Instructor + Casbah Dance Experience was named Best Troupe of the Year 2 years in a row by Mideastern Dancer magazine. Morocco was also voted Ethnic Dancer of the Year in ’97, Instructor of the Year in ’98 & given the Lifetime Achievement award in 2002 by Zaghareet Magazine. In 2005 MECDA voted her their Humanitarian Award for her “body of work” over a lifetime in furthering and enriching Near and Mid-Eastern music and dance & in 2006 the Isis Foundation gave her a Lifetime Achievment Award in Ethnic Dance from the Near and Middle East. In 2009, Morocco was appointed Grand Marshall of New York’s Dance Parade and in 2013, she was honored in Hanover, Germany (at Asmahan el Zein’s Orient Festival), Augsburg, Germany (at Sabuha Shahnaz’ 30th Anniversary Gala Concert) and Maribor, Slovenia (at Ksenija’s/ Husa Zahir’s Gala Concert) for her over 50 years of research, teaching and performing. Morocco‘s research video series (#s1-6) was given the Giza Award in 2000, an interview with her was commissioned by the Dance Division of the Lincoln Center Library for the Performing Arts in NYC to be placed its Oral History Archives for future researchers & she was nominated for the Dance Heritage Coalition’s list of “America’s Irreplaceable Dance Treasures”. In July, 1999, Morocco was invited to Cairo, Egypt as a keynote speaker to present her paper on“Dance as Community Identity in Selected Berber Nations of Morocco” and to give 2 dance workshops, one in Raqs Sharqi (Oriental Dance) and the other in Moroccan Guedra & Schikhatt, at the international conference of the UNESCO organization ICHPER-SD (International Council on Health, Physical Ed., Recreation – Sport & Dance), in collaboration with the University of Minya. In May, 2001, she was also honored for her more than 41 years’ work in this field at the 2nd International Conference on Mideastern Dance at Orange County Community College in California. She presented a paper (“Preserving Cultural Traditions: Difficulties Inherent in Adapting Guedra for Stage”) at the International Federation of Theater Research’s Congress, held at the University of Amsterdam (Holland) in July, 2002, lectured in Cairo on apects of Oriental dance in 2000, 2002, 2005 & 2006 at Raqia Hassan’s weeklong seminars and is one of the regular teachers. She was choreographer and cultural consultant for multiple award-winning Moroccan director Nabil Ayouch‘s major motion picture for Pathe Renn films: “Whatever Lola Wants”, was a main lecturer, presenting *3* different papers at the International Conference on Oriental Dance in Prague in December, 2014 and will be back in January, 2018. Since 1964, Morocco has written for several publications in her field and been reprinted in dance, medical and feminist publications internationally. A true pioneer in the field, she taught a 3-credit course in Middle Eastern Dance and Culture at the State Univerity of New York (Purchase, NY) in the mid 1970s. 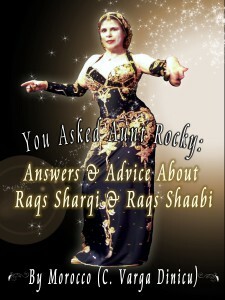 Her 424-page reference book, “You Asked Aunt Rocky: Answers & Advice About Raqs Sharqi & Raqs Shaabi” received numerous 5-star reviews and is considered the go-to book in the field. It has been translated into Chinese and German and will soon be in Spanish. Her second book, “The Fundamental Movement Vocabulary of Raqs Sharqi” (151 pages), will be out in Chinese in August, 2017. She continues her extensive performing career as a soloist and with her dance company, including Lincoln Center, the U.N. (General Assembly and Dag Hammerskjold Theater), Delacorte Dance Festival, Columbia University, Statue of Liberty, Cooper-Hewitt Museum, lecture/performances for the NYC Department of Cultural Affairs, Asia Society and Museum of Natural History, in Moscow And Leningrad (USSR), on Broadway (“I Had A Ball”), her own TV Special: “Testspiele” (WDR#l/Koln, Germany), 1st Women’s Festival of the Performing Arts, numerous U.S. TV shows and films, *4* 5-Lecture Series at the Museum of Natural History and innumerable clubs and ethnic/family celebrations. 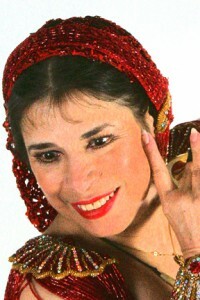 Director/researcher/choreographer of Morocco & the Casbah Dance Experience (Mideastern and North African dance and music in concert), her award-winning dance company and school, which had its debut at Lincoln Center in 1978 and was the only dance company to be presented five times at Riverside Dance Festival, which also honored CASBAH by placing a tape of their 1983 concert in its permanent archive (1 of only 4 shown at their 1985 fundraiser!). Morocco created the Casbah Dance Experience to show the varied, fascinating ethnic dances of the Middle East and North Africa to the general public and give “a bit of home” to North Africans and Mideasterners in the West. She’s spent over 53 years trying to find, recover, preserve and present them before they disappear, due to modernization and/or fundamentalism. It’s a valuable heritage that must be saved from extinction! Morocco collects all music, steps & styles possible of each dance from many on-site viewings, questions & participation, etc. and chooses a variety of the most typical steps & figures, presenting them in choreography true to their origins, while pleasing to the eyes & ears of the theater public. Morocco led many highly successful dance/culture tours to Morocco, Egypt and Turkey, introducing Western performers, teachers and fans of these dances to the rich variety of music and dance indigenous to those areas. She’s taught at SUNY-Purchase and Amas Repertory Theater and continues to teach at her own Academy of Mideastern Dance in NYC. Morocco opened the door for Mideastern Oriental dance in museums, schools, at Lincoln Center, SUNY-Purchase and as a valid, valuable concert form. Research has taken her to Morocco, Egypt, Tunisia, Algeria, Lebanon, Syria, Jordan, Iraq, Iran, Turkey, Azerbaijan, Uzbekistan, Turkmenistan, Kazakhstan, Tadjikistan, Kirghizia, Georgia, Armenia, Greece, Yugoslavia, etc.